In his 2003 film SWIMMING POOL, filmmaker Francois Ozon explored the ways in which real life influences the creative process. 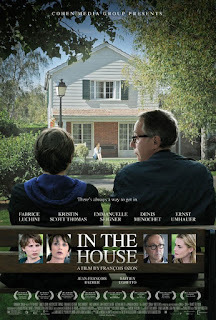 IN THE HOUSE deals with similar territory, but this time Ozon factors in the role critics and an audience can play as their reactions affect the creator of a work in various ways. Beyond that, however, it's also a highly entertaining satire of middle class values and attitudes about art. As Germain doles out Ds and Fs for the one and two line essays most of his class turned in for an assignment about what they did over the weekend, he is surprised when he comes across a paper written by Claude (Ernst Umhauer). The quality of the writing in and of itself shows significant maturity and the promise of real talent, but Germain is somewhat shocked by the uncomfortably voyeuristic detail Claude goes into regarding a visit at the home of his friend Rapha (Bastien Ughetto). Jean is even more dismayed, going so far as to suggest that her husband bring the paper to the attention of the principal. The irony is not lost on us that the first response of this couple, both of whom consider themselves sophisticated about the arts, is to stifle Claude's creativity. Rather than report the boy, however, Germain decides instead offer Claude his encouragement and guidance, hoping to make him into his idea of what a good writer should be. Claude incorporates his teacher's various suggestions, often with results that further antagonize his mentor and elicit further criticisms. And yet, the truth is both Germain and his wife have become so thoroughly enraptured by the tales that the prospect they might come to an end leads Germain to contemplate performing a risky and highly unethical action. Pointing out the foibles and hypocrisies of pompous academic types is kind of like shooting fish in a barrel and could easily get tiresome. That never happens with IN THE HOUSE thanks to the subtle and clever ways in which Claude absorbs and subverts each piece of criticism and advice given to him by Germain. 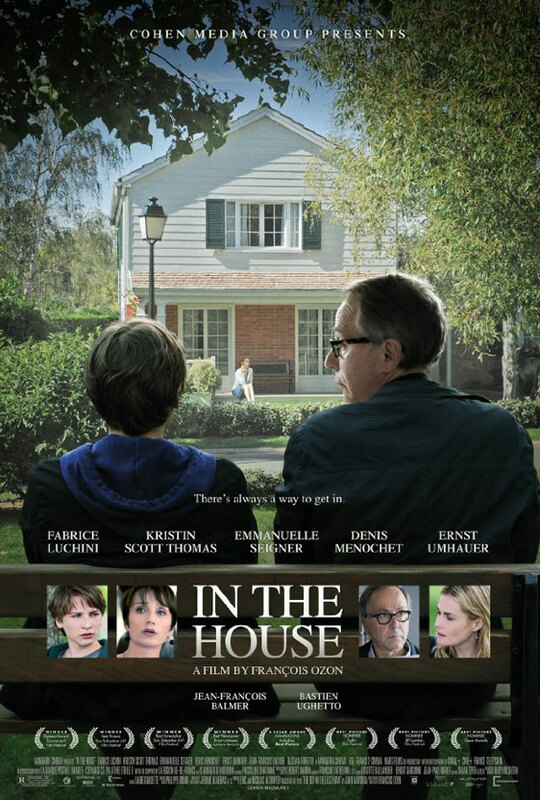 There's never much doubt about who is really teaching who, but IN THE HOUSE nonetheless remains entertaining and surprising right up to the end. 3 1/2 out of 4 stars.